Woodbury City Recorder Charlene Odom and Mayor Harold Patrick review information about annexation at city hall Tuesday. Now that he has additional time to devote to his role as Mayor of Woodbury, Harold Patrick has an agenda full of items he would like to get accomplished. 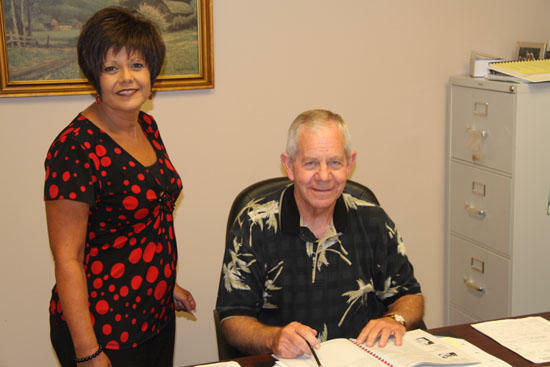 Patrick, who has been mayor since December of 2008, recently retired as Cannon County Clerk and Master, a position he held for 13 years. While being mayor of Woodbury is considered a part-time job, Patrick certainly isn't acting as though it were. • Assisting the department heads in their efforts to provide the best service possible to the residents of the city. Patrick also wants to growth Woodbury's economic base, although he is aware doing so will be tough as the economy continues to struggle. "I would like to expand our revenue base by attracting new businesses to our town," Patrick said. "This will be difficult until the recession ends." Patrick said the closing of Jennings Motors was a tremendous loss for the town, but feels the community is large enough to warrant the investment of an automobile dealership. "We need a new car dealership in Woodbury and I will assist anyone in any way possible to achieve this goal," Patrick said. "The loss of the Ford dealership really hurt this town and I will work tirelessly to attract another one. "In my opinion, our town and county is large enough to support a new dealership and if possible, I want to make it happen, be it a Ford, Chevy or another brand." Patrick said he would also like to work on regaining Cannon County's status as a Tennessee Three-Star Community. "This is important, as it gives more points on grant applications," he said. Another way Patrick would like to see Woodbury grow is through annexation of Cannon County property adjacent to the town. "Expanding the tax base would be the biggest benefit (of annexation), but controlled growth is important and would be meaningful and wise as it signals that the town is proactive and promotes growth, residential and commercial. An increase in the population would also increase the amount of grant money the town receives. I really want to move forward, not backward, and growing the size of the town accomplishes that," Patrick said. Patrick said any annexation would have to be well planned, because there can be downsides to expansion. "If you expand you have to also extend services such as sewer lines, sanitation services, police and fire protection, etc.," he said. "You must also be careful about annexing property that is in the floodplain. Our planner from the State Department of Economic and Community Development advises this is prohibited. Still, I believe the benefits of annexing outweigh the negatives." Patrick said the town will look in all directions when considering expansion. "Our state planner is currently evaluating this process. Initially, I thought it made sense to annex the property West of town on the left side of the road to equal the same length as is on the right side. However, we have the issue of the floodplain on the left side. It may still be possible, but the state must guide us on this issue. West, North, and especially South of town are currently being looked at and will be studied by our planning commission in the coming months." Patrick was asked what have been the positives and negatives so far of his moving in to semi-retirement? "The positives are flexible hours, dedicated staff to work with, and the people of Woodbury are the greatest! I am honored to serve as Mayor of the Town of Woodbury. The only negative that I can think of is that I have not received my first 'retirement' check, yet!"